Making tea can be an art form – judging the perfect temperature for the water and allowing the leaves to infuse for just the right period of time. It doesn’t just depend on the type of tea you’re making, either – as any fan of a good brew knows, personal preference plays a huge part as well. One person’s perfect cuppa is another’s stewed disaster. 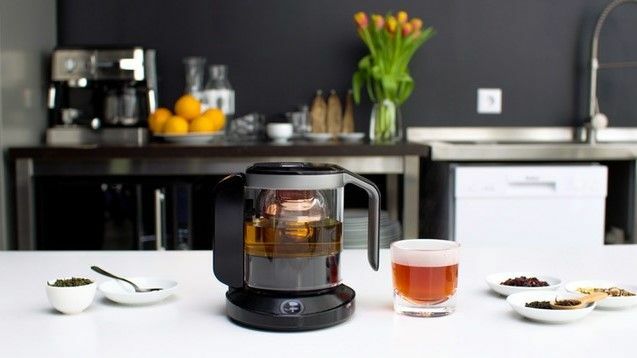 Teplo 2.0 (the successor to the Teplo portable tea maker) is a smart kettle designed to solve these problems, meaning the tea aficionado doesn’t have to linger over a teapot with an egg timer to get the perfect brew. Not only does it adjust the brewing conditions for the type of tea you’re making, it also factors in environmental conditions and biometric data. The kettle gathers environmental data, including brightness, temperature, humidity and sound, and with a touch of a fingerprint sensor, it will measure your body temperature and heart rate. If you’re stressed, the kettle will steep your tea at a lower temperature to produce a sweeter, more relaxing brew. If you’re tired, it can turn up the heat for a greater caffeine kick. It can even learn your preferences over time and make recommendations. To get started, just spoon any type of loose-leaf tea in the infuser and add room-temperature water to the kettle. Pop the infuser into the rotating chamber, select a tea type using the Teplo app, and the machine handles the rest. The leaves will be lifted out of the water when they’ve finished steeping to avoid stewing, and your tea will be kept at the ideal drinking temperature for hours. Teplo 2.0 is the creation of startup Load & Road, whose founders Kazunori Kawanobe and Mayuresh Soni hail from Japan and India respectively – both countries with long histories of brewing, drinking and enjoying tea. “Traditional tea masters change tea brewing conditions by seeing or feeling the drinker’s mental and physical state,” says Kawanobe. You don’t need to worry about your smart kettle leaking your personal data, either; the data is transmitted securely to the tea maker’s own servers for processing, and if you aren’t comfortable with that, you can opt out of the biometrics entirely. Teplo 2.0 is currently seeking backers on Kickstarter, with an early bird price of $279 (about £210, AU$400) and an expected retail price of $349 (about £270, AU$500).